Complete OA Analog IC platform. Better than VXL. Far less cost. Built on OA from scratch without legacy code, Analog Rails Basic uses the same database as Virtuoso. Never have a DRC nor LVS violation. Crossprobing and backannotation at all times. Infinite supply of multithreaded co-simulation licenses. 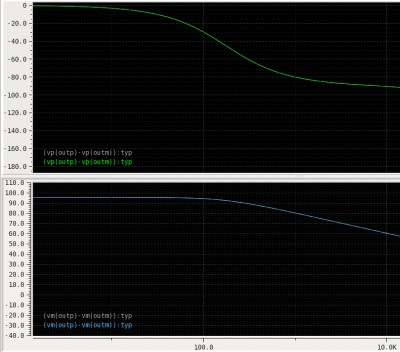 Cosimulation and multithreaded, users can run millions of fets alongside both digital and analog behavioral simulations on a single engine simulator. No need to klunk away with an analog and digital simulator on a backplane, our XMS simulator/environment is way superior to AMS Designer. Included is Harmonic Balance and built-in RF measurements, such as transient noise. Never again pay for a simulator, XMS is the best simulator in the business. Works with BSIM3, BSIM4, BSIM6, etc. Users can also optionally simulate with 3rd party Hspice compatible simulators just in case they want to double verify. The netlister is customizable. Hundreds of behavioral models, both analog and digital are also included. Place settling time, overshoot, bandwidth, phase margin, risetime, and etc. 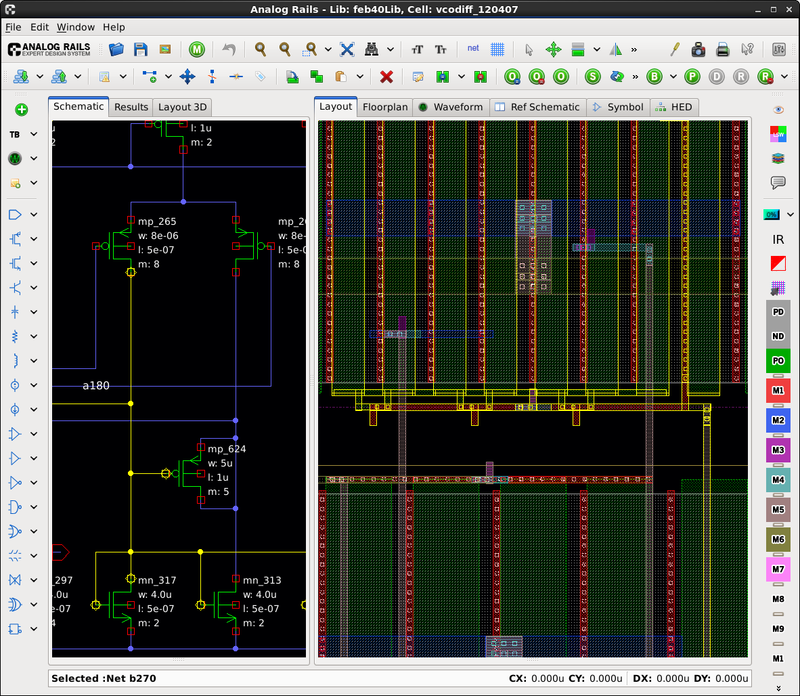 components into the schematic, along with multiple analysis components (ac, dc, tran, pss, etc). Corner setups are included in the analysis components. All measurements receive the variation and the largest culprits, both the devices and their parameters, causing the variation. Much more powerful than DRC and LVS, the users cannot make a DRC or LVS violation. Primitives (fets, caps, resistors, bipolars, and differential structures) are generated automatically based on the technology file. No CAD scripts required. Structures snap/repel/permute based on schematic connectivity. Collision avoidance on wiring. Once again, it is impossible for users to make violations. Even when flattening the layout, Analog Rails continues to crossprobe the schematic and layout. The circuit designer can always follow the signal...even in 3D! Why wait months to get layout parasitics, such as STI Stress Effects, length of diffusion, and well proximity? DC Currents can be off by 20% without knowing these layout generated values. Now setting reltol has more meaning. Includes synthesis with static timing optimization, automatic cell characterization and fully integrated into the Analog Rails platform, all with cross probing, capacitance backannotation, 3D views, etc. Automatic feedback loops. No manual intervention needed. Users can automatically generate the gate level netlist and schematic based on their RTL code with a simple graphical interface in the same design environment as Analog Rails. It's so easy, an analog circuit designer can do it. Digital Rails makes digital place and route trivial to run due to built in logic cells, synthesis, timing characterization, RCx, static timing tools, clock trees, and automatic flight line based pin generators. The Digital Rails place and route tool automatically runs timing feedback loops and adjusts the layout, allowing users to click onto the PNR button and not require any manual intervention in order to come up with the fastest clock frequencies possible for the given RTL code being processed. The parasitics will always be backannotated into the schematic. The resuting block will instantiate perfectly onto the analog grid system for use at the higher level of the design. A vast set of process independent parameterized (w_pmos, w_nmos, L) digital library topologies ships with Analog Rails. Standard cell layouts will be automatically generated. We don't need your digital layouts. Works in both the analog editor and digital P&R. The substrate (sub) terminal is isolated from the vssd terminal, where the users can optionally tie the substrate to the digital ground or isolate the supply from touching the main substrate. All logic cells contain behavioral views for XMS and SystemVerilog. Rise/fall times based on Cload, W, L, Cx. Characterization is automatically done in Digital Rails. Upon PDK creation, merely define the corners, the slope steps, and the capacitor loads. The liberty formats will be automatically generated and will be used by our built-in static timing tool. An infinite number of System Verilog simulator licenses are included in Digital Rails. The built-in logic cells contain Verilog views that allow users to run system simulations easily. Just add the top level stimulus. All logic cells contain both analog and digital behavioral views for XMS and SystemVerilog. The output slopes are a function of the supply, widths, lengths, and capacitive loads. This is especially important after post layout (RCx) extraction. The full chip simulation can be run with the included digital and mixed signal simulators. Basic + Digital + Automatic Analog. 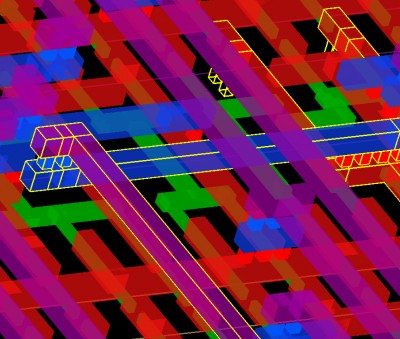 Reduce the former “full custom” IC design cycle from months down to hours. The Analog Rails mixed signal platform is built around the automation tools. With the ability to go bottom to top to bottom to top quickly, do not fear last minute changes...embrace them. Place your measurements and analysis components in our OA based schematic, choose properties (including transistor operating regions) to optimize, go to lunch. Return to see the final circuit sized according to spec over all corners. Runs AC, DC, and transients at the same time on multiple machines. Our best feature. Low capacitive routes. Our multi-block and Transistor-level router also handles differential signals, with wire extensions and shields. We route 100% of the signals and ensure they are DRC correct. Routes are EM friendly. Also includes a power supply mesh. Well taps are automatically generated. Preroutes optional. Set automatch on, press the "P" button, and enjoy the show. We know analog, and you can expect to see common centroid structures with guard rings, multiple dummies, and extended wells to reduce the STI stress and well proximity effects. Don't trust our layouts? Our name begins with "analog"
Cx backannotated into the schematic, RCx, selected net RCx, EM, IR drop, resistance between 2 points in the layout...we do it all! Because of our focus on differential signals, we provide density fill that is aware of your sensitive routes and differential structures/wires. Easily retarget your schematics from one process to another. Move designs from 180n to 14n easily. Migrate => Optimize <=> Sensitivity <=> Automatically layout. Bada bing, bada boom...it's done!